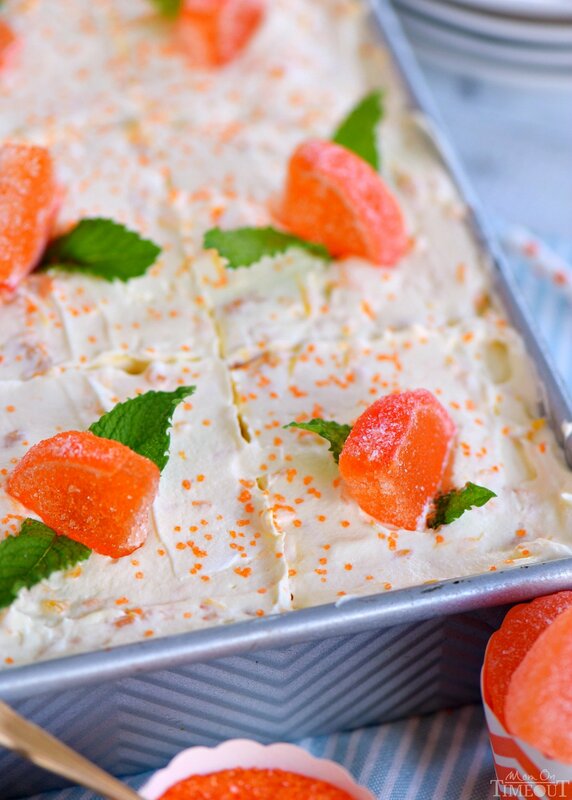 This easy Orange Creamsicle Poke Cake is a wonderful addition to all your summer parties! 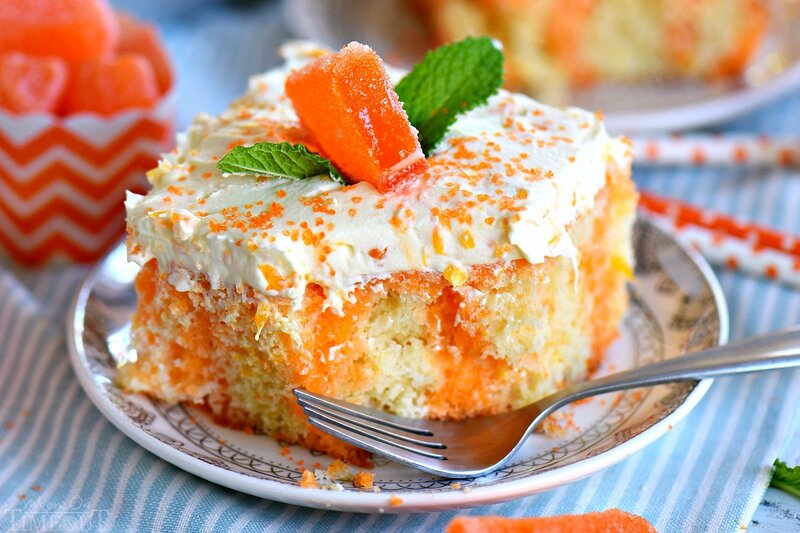 A lovely vanilla cake that is bursting with orange flavor and topped with a fluffy orange and vanilla frosting that no one will be able to resist. We love to serve this with grilled chicken made with our 5-star chicken marinade and my famous broccoli salad – delicious! Creamsicles have always been one of my favorite summer time treats. That combination of orange and vanilla is just so magical! Today I’ve recreated that magical combination in cake form. It’s really one of my summer time staples because the flavors are just so fun and I love to decorate this easy snack cake. One of the best things about this orange creamsicle cake recipe is that you get that fun contrast in colors in the actual cake. How? With JELLO! Poke cakes are a great way to add some bright color and, of course, flavor to any cake. It’s super simple to do and makes the cake extra moist as well. I used a vanilla cake mix because, well, vanilla and orange is what makes a creamsicle a creamsicle. If you only have a white cake mix on hand you could add a teaspoon of vanilla extract to the mix to help with the vanilla flavor. For even more vanilla flavor, I used Almond Breeze Vanilla almondmilk. It’s delicious and creamy and the perfect addition to this creamsicle cake recipe. It’s available in both refrigerated and shelf stable so you can keep it on hand in the pantry. Because we’re using a cake mix here, I added some orange zest to really add freshness to the cake. This is a great way to pump up the flavor anytime you use a box mix. After the cake has baked, poke holes in the top using a skewer (see video below). You can also use a fork if you like. Pour in the JELLO mixture and then let the cake chill before frosting. Don’t go crazy when you poke holes in the cake. If you over do it, you’ll end up with a cake that’s the color of your jello. You want the holes to be far enough apart that it gives the pretty stripes throughout the cake. This frosting is one of my favorite frostings to make. I usually make the pineapple version like I did for this cake and this cake, but a can of mandarin oranges really brought this cake to life. It gives the frosting a pale orange color which is just beautiful. You can see the mandarin specks throughout. If you prefer, a cream cheese frosting with some orange zest in it is also super delicious! This cake is dairy free thanks to Almond Breeze almondmilk. 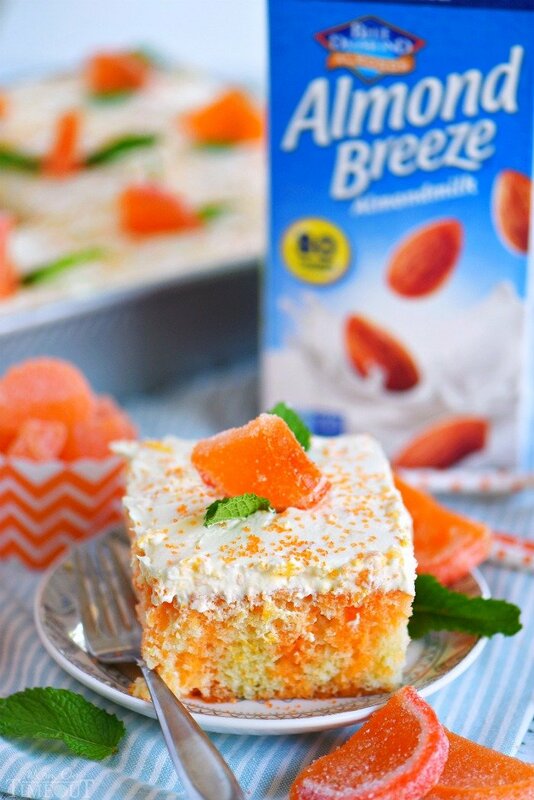 I used the vanilla Almond Breeze almondmilk because you really can’t add too much vanilla flavor to this Orange Creamsicle Cake recipe. Make sure you let the cake chill for several hours before frosting. You want that jello to really soak in and set up. I chill for another 30 minutes or so after frosting just to let the flavors meld. If you are in a rush, you can serve immediately after frosting. 9 x 13 baking dish – this easy creamsicle cake is baked in a 9 x 13 baking dish. I prefer this one because of it’s nice square corners and straight sides. 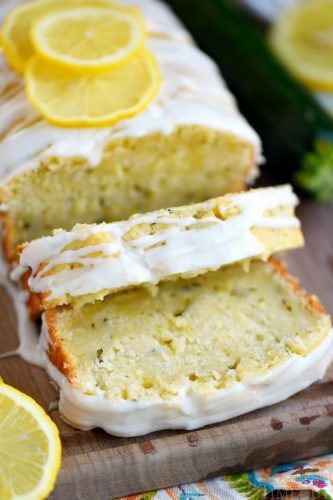 Zester – that orange zest gives amazing flavor to this cake and a little zester is the perfect tool for the job. Juicer – use your hands if you can but if you have carpal tunnel like I do, a juicer is a nice reprieve. Whisk – much faster than a fork when you’re whisking the water and JELLO together, and it does a better job too! Offset spatula – this handy tool makes quick work of spreading that deliciously fluffy frosting! 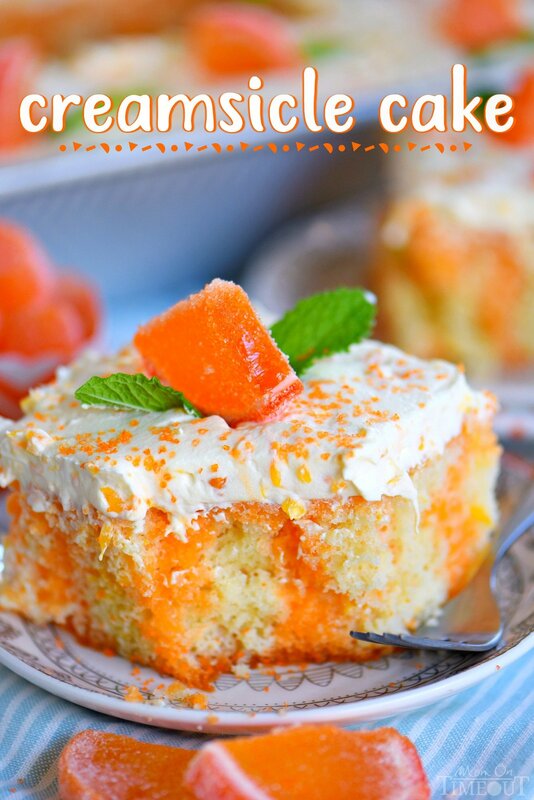 This easy Orange Creamsicle Poke Cake is a wonderful addition to all your summer parties! 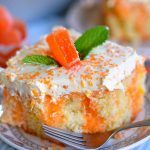 A lovely vanilla cake that is bursting with orange flavor and topped with a fluffy orange and vanilla frosting that no one will be able to resist! Bake using package directions. Remove from oven and let cool on a rack for approximately 10 minutes. Use a skewer to poke holes in the top of the cake. Place orange JELLO mix in a heat proof bowl and slowly add boiling water. Whisk until the JELLO has completely dissolved. Stir in fresh orange juice. Carefully and slowly pour JELLO mixture over the top of the cake. Refrigerate for at least 3 hours. Beat mandarins and pudding mix together until combined. Does Almond milk have to be used or could I use 2% which is what I buy. Any milk will work in this recipe Sandi – enjoy! 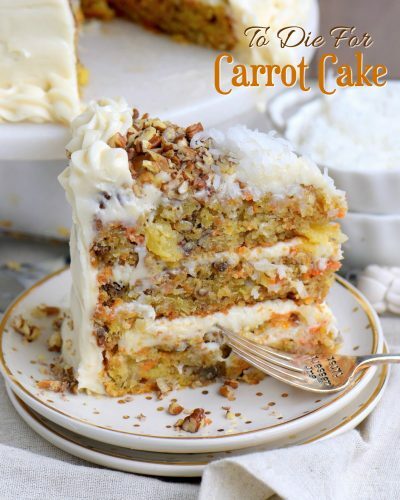 That creamsicle cake was a hit with everyone I keep getting request to make them..so easy and [email protected] love all your blogs carrot cake that’s all time favorite. Keep blogging. Thank you SO much Barbara! Hope you’re having a lovely week! This is my favorite of all time and much easier than the recipe appears . It really is wonderfully easy and I just love it for summer Veronica! Thanks for stopping by! Have a great weekend! 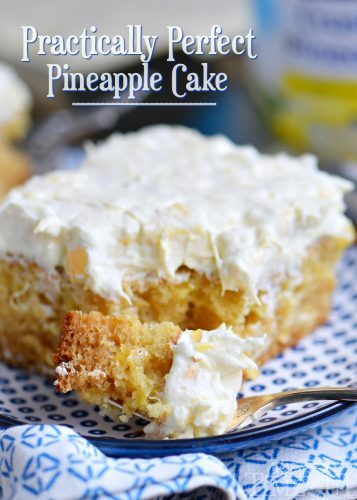 this cake is scrumptiously delicious and a big favourite in my house now. 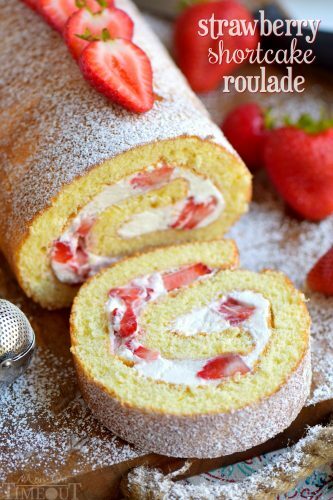 have made it several times and always a big hit all year round for me. Love that so much Michelle! Thank you!